West Herts were previously known as Watford Rovers who were formed in 1881 by Henry Grover, who went on to play for the club as a full back. Rovers, originally composed entirely of amateur players, held home games at several locations in the town of Watford. The team first competed in the FA Cup in the 1886–87 season, and in 1889 Watford won the County Cup for the first time. The team became the football section of "West Hertfordshire Club and Ground" in 1891, and consequently moved to a ground on Cassio Road. As "West Herts" they joined the Southern Football League in 1896. West Herts fortunes slumped at the start of the 1897/98 season and attendances were less than 200. They took the bold step of turning professional and their fortunes revived. Watford St. Mary's were runners up in the Hertfordshire Senior Cup of 1894/95 and attracted crowds of 400 to 500 even when West Herts were at home. The two clubs talked of an amalgamation, which ultimately occurred on 15 April 1898. This was reported by the Watford Observer of the 7th May 1898. It was agreed that the two clubs should complete their remaining fixtures for the season. The new club was named Watford Football Club. Football resumed in 1946, with Watford still in the Third Division South. A 23rd-placed finish in 1950–51 meant that the club had to apply for re-election to the league once more, but again teams in the First and Second Divisions unanimously voted for Watford to stay in the league. McBain returned in 1956, and the team remained in the division until 1958; the league was restructured into four national divisions for the 1958–59 season, and Watford were placed in the Fourth Division. Ron Burgess replaced McBain during that season, and in the following campaign Burgess presided over Watford's first Football League promotion. This team included Fourth Division top scorer Cliff Holton, who scored a club record 42 league goals in the season. Holton was sold to Northampton the following year after another 34 goals, to the anger of supporters. Burgess was succeeded by Bill McGarry, who bought new players such as Charlie Livesey and Ron Saunders, and in his only season at the club led the club to what was at the time its highest ever league position: third in the Third Division. Eighteen-year-old Northern Irish goalkeeper Pat Jennings also featured under McGarry, and made his international debut despite being a Third Division player. McGarry joined Ipswich in 1964, and was replaced by player-manager Ken Furphy, from Workington Furphy rebuilt the team around players such as Keith Eddy and Dennis Bond, but after holding Liverpool to a draw in the FA Cup and narrowly failing to win promotion in 1966–67, Bond was sold to Tottenham Hotspur for £30,000, Watford's record transfer receipt at the time. Furphy's rebuilding came to fruition in 1969 with the signing of Barry Endean, whose arrival marked the start of an unbeaten run after Christmas. Watford secured the Third Division title in April, at home to Plymouth Argyle. A year later Watford reached the FA Cup semi-final for the first time, defeating First Division teams Stoke City and Liverpool along the way. Hampered by a lack of funds, however, Furphy eventually joined Blackburn Rovers, to be succeeded by George Kirby. Forced to sell players to survive, Watford fell back into the Third Division in 1972. The team continued to struggle in the third tier, and despite a managerial change, Watford were relegated again in 1975. Following Taylor's departure, Wimbledon manager Dave Bassett was appointed as his replacement, and England winger John Barnes was sold to Liverpool. After 4 wins from his opening 23 league fixtures, Bassett was sacked in January 1988. Watford were bottom of the First Division at the time of his departure, and Steve Harrison could not prevent relegation at the end of the season. In 1988–89, Harrison's Watford failed to return to the First Division, after defeat in the Second Division play-offs. Harrison departed in 1990, and over the next few years, the closest Watford came to promotion was a seventh-placed finish in Division One in the 1994–95 season. However, in the following season – Glenn Roeder's third as manager – Watford struggled. Despite the return of Graham Taylor as caretaker manager in February 1996, the club was relegated to Division Two. Following the relegation, Taylor became Director of Football, with former Watford midfielder Kenny Jackett as manager. After a mid-table finish in Division Two in 1996–97, Jackett was demoted to the position of assistant manager. Taylor returned as manager, and won the Second Division title in 1997–98 – Watford's second league title under his management. A second successive promotion followed in 1998–99, thanks to a 2–0 play-off final victory over Bolton Wanderers. Watford's first Premiership season started with an early victory over Liverpool, but Watford's form soon faded, and the club was relegated after finishing bottom. Graham Taylor retired at the end of the 2000–01 season, and was replaced by Gianluca Vialli. Wage bills at the club rose by £4 million during Vialli's tenure, and the club finished 14th in the division in 2001–02. Vialli was sacked at the end of the season, following a dispute with the club's board over the wage bill. He was replaced by Ray Lewington, who had joined the club the previous summer as Vialli's reserve team manager. Watford finished third in the league in Boothroyd's first full season, and defeated Leeds United 3–0 in the play-off final to gain promotion to the Premier League. But the team did not record a Premier League win until November, and Ashley Young was sold to Aston Villa for a club record fee of £9.65 million in January 2007. Watford finished bottom after only winning five league games, but did reach the semi-finals of the FA Cup. Boothroyd continued as manager, and spent heavily on players, including a then-club record £3.25 million for Nathan Ellington. Watford led the Championship by several points early in 2007–08, but only finished sixth; Boothroyd's team were defeated 6–1 on aggregate by Hull City in the play-off semi-finals. Boothroyd left the club by mutual consent three months into the 2008–09 season, with Watford 21st in the Championship table. Under Boothroyd's successor, Brendan Rodgers, Watford finished 13th. Rodgers left to manage Reading at the end of the season; Malky Mackay, who had previously served as caretaker manager, was his replacement. Amid the departures of several key players during Mackay's tenure, including Tommy Smith and Jay DeMerit, and the club coming close to administration, Watford finished 16th in 2009–10 and 14th the following season. Mackay left to manage Cardiff City in June 2011 and was replaced by Sean Dyche. Despite presiding over Watford's highest league position in four years, Dyche was dismissed as Watford manager in July 2012. He was replaced by former Italy international Gianfranco Zola following the Pozzo family's purchase of the club. Dyche went on to achieve success with Burnley and become one of their longest serving football managers. Jokanović and Watford did not renew his one-year contract and the manager was replaced in June 2015 by the Spaniard Quique Sánchez Flores. Watford's first fixture in their return to the Premier League was a 2–2 away draw with Everton. In the 2015–16 season, Watford reached the semi-finals of the FA Cup with a goal by midfielder Adlène Guedioura against Arsenal at Emirates Stadium, ending Arsenal's bid to win the competition for three successive times, and finished 13th in the Premier League. Near the end of the season, in May 2016, Sánchez Flores was sacked, because, as he stated, he and the owners "[did] not have the same point of view about the season," and was replaced by Italian coach Walter Mazzarri who signed a three-year contract. At the end of the next season, in May 2017, Watford finished 17th and Mazzari resigned, replaced by Marco Silva. The new coach was sacked after approximately six months, in January 2018, and the club hired Javi Gracia. Watford's initial nickname was The Brewers, in reference to the Benskins Brewery, which owned the freehold of Vicarage Road. This nickname did not prove particularly popular, and upon the adoption of a blue-and-white colour scheme in the 1920s, the club became predominantly known as The Blues. When Watford changed kit colours in 1959, supporters chose The Hornets as the team's new nickname, and the club later introduced a crest depicting a hornet. In 1974 the design was changed to depict Harry the Hornet, the club's mascot. The club's nickname remains, but in 1978 the hornet crest was replaced by a depiction of a hart – a male red fallow deer– on a yellow and black background. A hart represents the town's location in the county of Hertfordshire. Until Barnet and, later, Stevenage joined the Football League, Watford were Hertfordshire's only league club. Other nicknames have since been adopted, including The Golden Boys, Yellow Army and The 'Orns. When Watford play at Vicarage road their players traditionally enter the pitch at the start of the game to the Z-Cars theme tune. Watford Rovers played at several grounds in the late 19th century, including Cassiobury Park, Vicarage Meadow and Market Street, Watford. In 1890, the team moved to a site on Cassio Road, and remained there for 32 years, before moving to Watford's current stadium at nearby Vicarage Road. The new stadium was initially owned by Benskins Brewery; the club rented the ground until 2001, when it purchased the freehold outright. 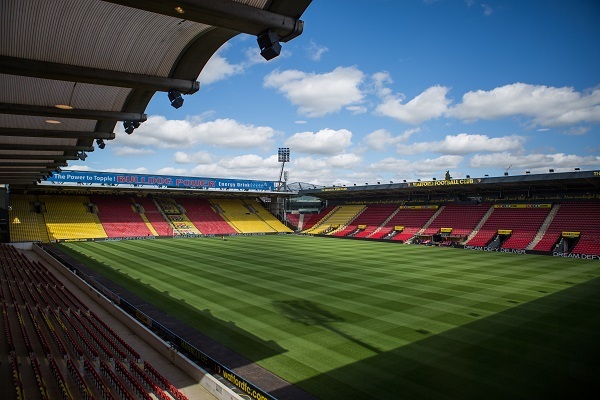 However, the club's financial situation worsened following the purchase, and in 2002 Watford sold the ground for £6 million in a deal which entitled Watford to buy the stadium back for £7 million in future. Watford took up this option in 2004 using a campaign backed and funded by the fans called "Let's buy back the Vic". 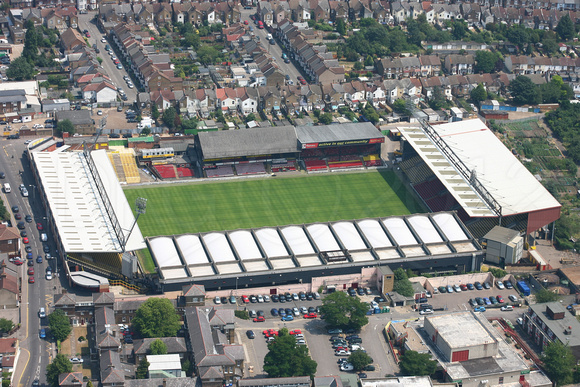 Vicarage Road is a four-sided ground with a capacity of 21,977. The East Stand, part of which was constructed in 1922, was closed to the general public in 2008 for health and safety reasons, although it still hosted the dressing rooms and the matchday press area. In November 2013, the East Stand was demolished and in its place a new steel-framed, 3,500-seater stand was constructed. The stand opened fully on Boxing Day 2014 and was named The Elton John Stand after the club's longstanding chairman. The Graham Taylor Stand (previously the Rous Stand), built in 1986, has two tiers and runs the length of the pitch, with the upper section containing the club's corporate hospitality. At either end of the pitch, The Vicarage Stand is split between the club's family section and away supporters, while the Rookery Stand is for home supporters only. Both stands were built in the 1990s, financed by proceeds from player sales. In the summer of 2015, The Elton John Stand was revamped in order to accommodate an extra 700 seats. This number was revised a day later to around 1,000 extra seats following the announcement of an expansion in the north-east corner. Between 1997 and early 2013, Watford shared Vicarage Road with rugby union side Saracens F.C. The stadium has hosted matches for the England under-21s, and senior international football between overseas teams. Elton John has also used Vicarage Road as a venue for concerts: He first played at the stadium in 1974 and returned in 2005 and 2010 to stage fundraising concerts for the club. Former events include horse and carriage shows and greyhound racing. The Watford Training Ground is located on the University College London Union Shenley Sports grounds in St Albans, Hertfordshire. Where the need for personal support has been identified, the Club will admit the personal assistant free of charge on the understanding that they are providing a service to the disabled supporter to enable them to access matchday facilities. The Club requires the disabled person and their PA to enter the ground together and sit together. The personal assistant must be in possession of a mobile phone and be able to communicate effectively with those in the vicinity. They must also be physically able to support the disabled person in the event of an emergency. Their ticket office is fully accessible. There is step and ramp free access via an automatic door and non-slip surfaces are around the office itself. A dropped counter and induction loop are available inside. The queueing system is fully managed on matchdays and their staff will be available to provide any additional support you require. Accessible viewing areas are available in the Rookery, Lower Graham Taylor, Upper Graham Taylor and Sir Elton John Stands. Visiting supporter facilities are available in the Vicarage Road Stand. There is personal assistant space available in all areas. Dedicated matchday disabled liaison officers are also posted in all areas. This stand has 13 wheelchair spaces and 11 amenity/easy access spaces at elevated level. There are also 34 wheelchair spaces and 30 amenity/easy access spaces at pitch level. Step-free access to all spaces is via the accessible entrance next to turnstiles 29-36. Two accessible toilets are available in the concourse, and another is accessible from the pitch-side positions. All accessible toilets are Radar Key operated and have support rails and alarm cords fitted. This stand has 56 wheelchair spaces and 36 amenity/easy access spaces at elevated level. Access is via the accessible entrances next to turnstiles 37-43 and turnstiles 1-11. Step-free access is via a platform lift from turnstiles 37-43 or a passenger lift from turnstiles 1-11. Accessible toilets are available in the concourse, which are Radar Key operated and have support rails and alarm cords fitted. A further 12 amenity/easy access spaces are available in the front row, which are accessed via the accessible entrance next to Rookery turnstiles 29-36 and have step-free access. This stand has 24 amenity/easy access spaces at elevated level. Access is via the accessible entrance next to turnstiles 1-11. There are four steps up to the seats. An accessible toilet is available in the concourse, which is Radar Key operated and has support rails and alarm cords fitted. This stand has 10 wheelchair spaces at elevated level. Access is via the accessible entrance next to turnstiles 23-24. Step-free access is via a passenger lift. An accessible toilet is available at the lift exit point which is Radar key operated and has support rails and alarm cords fitted. There are also 11 amenity/easy access spaces at elevated level and 16 amenity/easy access spaces in the front row. Step-free access is via the accessible entrance next to Rookery turnstiles 29-36. An accessible toilet is available in the concourse, which is Radar Key operated and has support rails and alarm cords fitted. This stand has 32 wheelchair spaces at elevated level for visiting supporters, 10 towards the back of the stand and 22 towards the front. There are also 15 amenity/easy access spaces at elevated level 9 towards the back of the stand and 6 towards the front. Access to the higher positions is via the accessible entrance next to turnstiles 15-18. Wheelchair positions are step-free, amenity/easy access spaces have 8 steps with hand rails. An accessible toilet is available on the concourse, which is Radar Key operated and has support rails and alarm cords fitted. Access to the lower positions is via the accessible entrance next to turnstiles 23-24. You can take a tour of their accessible seating provision, including entrances and toilet facilities, below. The tour includes a highlight reel on which you can select the area you are interested in. It also gives you 360° views from the seating areas and you can click on target icons for more information about each area. Rookery and Graham Taylor Stands. Vicarage Road and Sir Elton John Stands. As well as housing an accessible toilet, the Changing Places facility at Vicarage Road includes a height adjustable adultsized changing bench, mobile hoist, shower, a screen to allow some privacy as well as a wide tear off paper roll to cover the bench. The facility is ideally positioned near both wheelchair and amenity/easy access spaces in the South West Corner, between the Rookery and Lower Graham Taylor Stands. Those seated in other areas of the stadium will also be able to access the facility by speaking to their matchday disabled liaison officers. Should supporters wish to be seated near the Changing places facility, our ticket office staff will be happy to discuss all individual requirements and help with booking tickets in the closest places. An accessible toilet is available in the Sir Elton John stand concourse, which is Radar Key operated and has support rails and alarm cords fitted. Places in their Sensory Room, which enables children on the autism spectrum to enjoy football in a calm environment, are available for booking on matchdays. The room features a comfortably furnished viewing area, with an excellent view of the action and a state-of-the-art calming area featuring a bubble tube, fibre-optic carpet, soft seating, wall projectors, a glitter-ball with a colour wheel and a Bluetooth speaker system so that visitors to the room can choose their own music if the game becomes too distressing for their child. The club has 21 Soccer Sight headsets, so that visually impaired supporters can sit in any part of the ground and listen to the commentary provided by volunteers from the Watford Hospital Radio team. Please email disabled.supporters@watfordfc.com or call their ticket office hotline on 01923 223023 in advance of your visit with your name and seat number to order a headset, which will be delivered to your seat in time for kick off and collected at the end of the match. Headsets can be provided on a seasonal basis and are also available to visiting supporters. They offer a seat side food and drink ordering service for all disabled supporters. A drop counter and induction loop is also available in their kiosk situated in the Rookery concourse. Their staff at the catering kiosks will be happy to read out the menus. Evacuation procedures will be advised by the matchday Disability Liaison Officer and stewarding teams in the event of an evacuation being necessary. Assistance dogs are welcome at Vicarage Road. Should you wish to bring your assistance dog along, please call their ticket office hotline on 01923 223023 or email disabled.supporters@watfordfc.com so that they can make the necessary arrangements. They provide Wheelchair facilities on the official club coach travel to away games. Please call their ticket office hotline on 01923 223023 or email disabled.supporters@watfordfc.com to book a space on the coaches. Storage is provided for wheelchairs and walking frames for those supporters who are able to transfer into a seat. Please ask their matchday Disability Liaison Officer and stewarding teams for details when you arrive at the stadium. Signage around the stadium is gold type on a black background and their concourses are painted in highly visible colours, offering contrast between floors and walls. The nearest stations to the stadium are Watford High Street (0.6 miles, 12 mins walk) Watford Underground (1 mile, 20 mins walk) and Watford Junction (1.1 miles, 25 mins walk). Watford Junction Station has the most accessible facilities. The station is on the West Coast Mainline and fast trains come from London Euston. Services are run by London Midland and Virgin Trains. • Accessible taxis are available from the front of the station. • Buses to the stadium are also available. • Induction Loop is situated in the ticket office. • Staff available for additional assistance, which can be pre-booked up to 24 hours in advance. • Ramps for train access are available. • Accessible toilets are also available – Staff are able to provide Radar Keys. • Wheelchairs are available for use. A number of buses (10, 320, 324 and W1) run between Watford Junction station and the stadium. Frequent services are run by Arriva and Red Rose Travel and take around 10 minutes. All buses are low floor accessible and supporters should alight at the Watford General Hospital, which is situated next door to the stadium. Watford High Street Station has a single island platform which can be accessed by staircase only, there is no ramp or step free access. An induction loop is situated in the ticket office and staff are available to provide additional support. Services are run by London Overground. Watford Underground station is on the Metropolitan line. This station also has a single island platform which can be accessed by staircase only, there is no ramp or step free access. Staff are available to provide additional support. They provide 25 parking bays for wheelchair users, which are located in Stadium Way and Occupation Road, both are accessed via Cardiff Road. There is step free access to the Rookery, Lower Graham Taylor and Sir Elton John stands. All traffic will be held back for a short while after the match to ensure clear access for pedestrians. They also provide parking spaces for ambulant disabled supporters in the nearby Lower Hospital Car Park, which can be accessed via Thomas Sawyer Way. They provide a buggy service to bring supporters to the accessible entrance of their choice and supporters can also make the return journey to the car park by buggy. To book a space, please call their ticket office hotline on 01923 223023 or email your request to disabled.supporters@watfordfc.com. Spaces are provided for both home and away supporters and are subject to availability. Maps showing access routes for each car park can be provided on request when booking your space. A drop off point is also available at the junction of Stadium Way and Occupation Road, which is also accessed via Cardiff Road. Transport: Watford Junction (National) then bus OR Watford (Metropolitan Line) then 20 minute walk OR Watford High Street (London Overground) 12 minute walk. Bus Routes: 10, 320, 324 and W1 stop next to the stadium.